Lhermitte's sign or the Barber Chair Phenomenon is an electrical sensation that runs down the back and into the legs. It is produced by bending the neck forward. It can also be felt as a brief, stabbing, shock-like pain. In edition to running from the back of the head and down the spine, it can also be felt in the arms as well as the legs as I mentioned earlier. It is a common complaint in people who have multiple sclerosis. It can also be a sign of some other conditions like, trauma, vitamin B 12 deficiency, or by anything that causes compression of the spinal cord in the neck. This particular sign can also appear during or following high dose chemotherapy treatments. 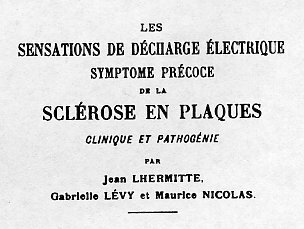 This MS sign, which is actually a symptom not a sign, was first discovered in 1917 by Pierre Marie and Chatelin. 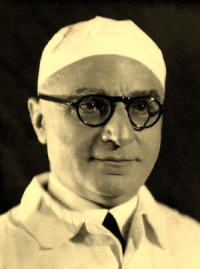 Jean Lhermitte published his first report about it in 1920. The article which made this sign well known wasn't written until 1924. The treatment for this phenomenon can include medication. Anticonvulsants have been prescribed to prevent it. Limiting movement in the neck with a soft collar is another treatment option. Cir's experience with this particular symptom has been more of a nuisance than anything. He never had any type of treatment for it. I just remember him talking about it with his friends on-line who also were experiencing it or had experienced it in the past. This symptom, for Cir, eventually just went away. If he still feels it, he doesn't really complain about it. By all means let your doctor know if the pain you feel is more pronounced. Try one on the treatment options. It definitely can't hurt.